Justin Brooks Verlander (born February 20, 1983) is an American professional baseball pitcher for the Detroit Tigers of Major League Baseball (MLB). In 2006, Verlander was named the American League (AL) Rookie of the Year. On June 12, 2007, he pitched a no-hitter—the first ever at Comerica Park—against the Milwaukee Brewers, striking out 12 batters and walking four. He pitched a second no-hitter against the Toronto Blue Jays on May 7, 2011, in Toronto, walking one and facing the minimum 27 batters. On November 15, 2011, Verlander was named the 2011 AL Cy Young Award winner by a unanimous vote, becoming the first American League pitcher since Johan Santana in 2006 to win the award in such a fashion. On November 21, 2011, Verlander was voted the AL Most Valuable Player (MVP), winning with 280 points over Jacoby Ellsbury's 242, completing a sweep of the Cy Young Award and MVP. He is listed at 6'5" and 225 pounds. In 2009, Verlander finished with a 19–9 record, an ERA of 3.45 and an MLB-leading 269 strikeouts, the most by a Tiger since Mickey Lolich's 308 in 1971. Verlander finished third in the AL Cy Young Award voting behind winner Zack Greinke and runner-up Félix Hernández. In the offseason, Verlander and the Tigers reached a deal for a five-year, $80 million contract extension. On July 3, Verlander earned his 10th win of the season. This marked the fourth time in five years he has had double digit wins before the All-Star break. On September 18, Verlander beat the Chicago White Sox, throwing a complete game to earn his 17th win of the season. Verlander was the first pitcher to win 17 games in four of his first five seasons since Dwight Gooden. He finished the 2010 season with an 18–9 record and 3.37 ERA. On July 31, Verlander took a no-hitter into the eighth inning before surrendering a single to Maicer Izturis. He walked two and struck out nine. On August 11, Verlander won his 100th major league game against the Cleveland Indians. On August 27, he became the first pitcher in the Major Leagues to reach 20 wins for the season. The victory also made Verlander the first Tiger since Bill Gullickson in 1991 to win 20 games, and the first Major League pitcher since Curt Schilling in 2002 to reach 20 wins before the end of August. In 2011, Verlander received the AL Sporting News Pitcher of the Year Award, The Sporting News Player of the Year Award, a Players Choice Award for Player the Year and Most Outstanding American League pitcher, and a USA Today American League Cy Young. Verlander was named the cover athlete of Major League Baseball 2K12. Verlander won both the 2011 AL Cy Young Award and the AL MVP Award. He was the first pitcher to claim an AL MVP Award since Dennis Eckersley in 1992, the first starting pitcher to do so since Roger Clemens in 1986, and the third Tiger starter to do so in franchise history, joining Denny McLain and Hal Newhouser. Verlander unanimously won the 2011 AL Cy Young Award, but won the AL MVP in a much closer vote. Verlander edged out Boston's Jacoby Ellsbury, 280 points to 242 points, while collecting 13 of 28 first-place votes. ^ a b 2013 Tigers Information Guide (PDF). 2013. pp. 211–222. ^ "Verlander wins AL MVP". Retrieved November 21, 2011. 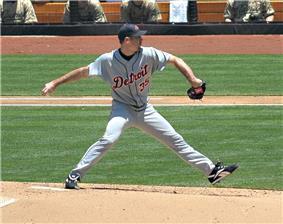 ^ Verlander makes his pitch Yahoo!, August 16, 2006. ^ "Rookies Verlander, Reyes get Game 1 starts". ^ Beck, Jason (February 4, 2010). "Tigers announce Verlander deal". ^ "wire reports, August 27, 2011". ^ "Detroit Tigers Top 10 Pitching Leaders". Baseball-Reference.com. Retrieved October 15, 2011. ^ a b "Justin Verlander Statistics and History". stickskills.com. Retrieved November 3, 2011. ^ "Detroit Tigers Top 10 Pitching Leaders". Baseball-Reference.com. Retrieved October 7, 2011. ^ "Verlander named the 2012 cover athlete". Retrieved October 7, 2011. ^ "Justin Verlander Wins AL Cy Young". MLBTradeRumors. November 15, 2011. Retrieved November 15, 2011. ^ Snyder, Matt. "Justin Verlander wins AL MVP." CBS Sports, November 21, 2011. ^ "Verlander nearly throws 3rd no-hitter for Tigers". ^ Meisel, Zach (July 10, 2012). "Verlander, Cain to be All-Star Game starters". ^ Sanchez, Jesse (July 1, 2012). "Rosters unveiled for 83rd All-Star Game". ^ Kepner, Tyler (October 13, 2012). "A Stamp on a Set of Division Series to Write Home About". ^ "Justin Verlander of Detroit Tigers agrees to deal which could be worth $202 million, sources - ESPN". ^ Verlander struggles, Indians hold off Tigers' late rally CBS Sports, May 11, 2013. ^ Verlander loses no-no, exits with tight quad; Tigers roll CBS Sports, July 14, 2013. 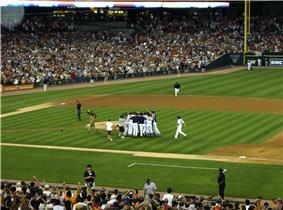 ^ "Verlander sends Tigers past A's in Game 5 gem". ^ a b Did you know? ALDS Game 5: DET 3, OAK 0 MLB, on October 11, 2013. ^ "Opening Day Start Offers Justin Verlander a Major Chance at Personal Redemption". ^ Snyder, Matt (March 17, 2014). "Justin Verlander to get opening day nod for Tigers". ^ Leach, Matthew (June 20, 2014). "Verlander's season struggles go beyond velocity dip". ^ Schmehl, James (July 2, 2014). 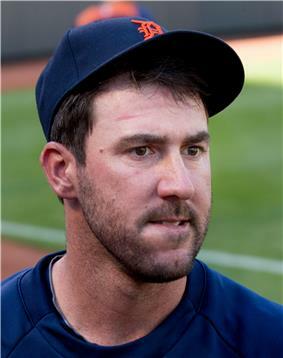 "'"Detroit's Justin Verlander admits All-Star streak will likely end this year: 'I didn't have a good first half. ^ "All-Stars unveiled, including 25 first-timers". ^ "Verlander to undergo MRI on sore right shoulder". ^ "'"Justin Verlander needs MRI for 'right shoulder soreness. ^ Trister, Noah (September 24, 2014). "Tigers beat White Sox 6-1, clinch postseason spot". cbssports.com. Retrieved September 25, 2014. ^ Chris, Cwik (April 2, 2015). "Justin Verlander to begin season on disabled list with triceps soreness". Retrieved April 2, 2015. ^ Beck, Jason (April 8, 2015). "Verlander to disabled list; Lobstein to start Sunday". MLB.com. Retrieved April 8, 2015. ^ Firstman, Diane (December 21, 2014). "Verlander's best role could be as a reliever". EPSN.com. Retrieved April 8, 2015. ^ Beck, Jason (May 31, 2015). "Verlander struggles with command in rehab start". MLB.com. Retrieved May 31, 2015. ^ Savage, Brendan (June 6, 2015). "Justin Verlander takes 'step I wanted to see' in Triple A, feels ready to rejoin Detroit Tigers". MLive.com. Retrieved June 9, 2015. ^ "Santana, Carrasco lead Indians to 5-4 win over Tigers". cbssports.com. June 14, 2015. Retrieved June 15, 2015. ^ Fenech, Anthony (August 26, 2015). "Detroit 5, L.A. 0: Verlander loses no-hit bid in ninth". ^ a b "Brooks Baseball · Home of the PitchFX Tool - Player Card: Justin Verlander". Brooks Baseball. Retrieved August 6, 2012. ^ Lemire, Joe (May 2, 2012). "Detroit Tigers' Justin Verlander defies conventional wisdom - Joe Lemire - SI.com". ^ "Justin Verlander Statistics and History - Baseball-Reference.com". 2006 Tigers Rookie of the Year award from the Detroit Sports Broadcasters Association. Only pitcher in Major League history to win Rookie of the Year, start in a World Series game, throw a no-hitter, and be an All-Star in his first two seasons. 2009 Tiger of the Year. Verlander is known for his unusual ability to "add" and "subtract" from his fastball velocity at any point in the game, giving him the ability to throw 100 mph or higher even in the late innings of games. This is despite the fact that he has thrown the most pitches in the major leagues since the beginning of the 2008 season. Verlander's average fastball velocity with no strikes is 94.7 mph, while with two strikes it is 97.0 mph. His power pitching frequently leads to high strikeout totals. In 2009, 2011 and 2012, he led the majors in strikeouts. Verlander throws four above average pitches: a hard four-seam fastball anywhere from 92-97 mph on average (topping out at over 100 mph on occasion), a slider in the low-to-mid 80s, a curveball at 78–81, and a circle changeup at 85–88 mph. Verlander tends to throw his slider only to right-handed hitters and his changeup only to left-handed hitters. He frequently uses his devastating 12–6 curveball with two strikes on the hitter. Justin's younger brother, Ben, also plays for the Tigers organization as an outfielder. They played one game together during spring training. On August 11, in a game against the Pittsburgh Pirates, Verlander allowed five runs, four earned, on four hits in only one inning. Verlander left the game with right shoulder soreness, in his shortest outing of his career. His previous shortest outing was 11⁄3 innings in 2008. Verlander would miss his next start, the first time that had occurred in his career. Verlander finished the 2013 regular season with a 13–12 record, a 3.46 ERA, and 217 strikeouts. His 2181⁄3 innings pitched were the lowest total since his 2008 season. Prior to the 2013 season, Verlander and the Tigers reached a seven-year, $180 million contract, with a $22 million vesting option for 2020 if he finishes in the top five in Cy Young Award voting in 2019. This contract made him the highest-paid pitcher in MLB history. Verlander finished second to David Price of the Tampa Bay Rays in a close AL Cy Young Award race. Verlander collected 149 points (12 first-place votes) to Price's 153 points (13 first-place votes). Verlander won (tie with David Price) his second consecutive AL The Sporting News Pitcher of the Year Award.